We love everything about cars here at Westgate Chrysler Jeep Dodge. If you’re interested in the exciting world of automobile racing, you’ll be especially excited to visit our part of Indiana for these unique attractions. You’ve probably heard of the Indianapolis 500, the famous IndyCar race that takes place every May at Indianapolis Motor Speedway. And if you’re a NASCAR fan, you’re also familiar with that series’ race, sometimes dubbed the Brickyard 400, which takes place at the speedway in the fall. 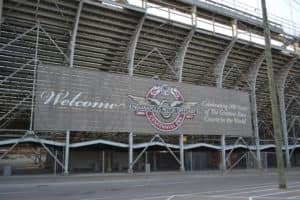 But Indianapolis Motor Speedway hosts many other races throughout the year, as well as being the site of many community events and even a museum. The speedway’s 2.5-mile track will be the place to go for racing events throughout September and October, and there are even holiday light exhibits in the winter. Check out the speedway’s calendar of upcoming events online so you don’t miss out on the fun. Visit this lesser-known racetrack to see some really exciting events. The drag strip here is considered to be one of the best in the world, and you can see racers putting themselves to the test on this 4,400-foot stretch of pavement throughout September and October. Make sure to visit in mid-September to see the 17th Annual NMCA World Street Finals, where elite turbocharged drag racers will go head-to-head during a three-day racing tour. And while you might not be able to take your own car on the track, you can participate in a 5-kilometer or 10-kilometer footrace in late October. Don’t miss this smaller Indianapolis racetrack, which is known for its unique figure-eight racing. The track also hosts kart races, which are especially fun to watch. Races are scheduled throughout the end of September, but later in the fall is when the fun really starts. The “Terrordrome,” from Sept. 28 through Nov. 3, a haunted racetrack experience that promises more than the usual amount of thrills. Details on this event are being kept under wraps, but we’re eagerly anticipating the chance to check out this special Halloween event for ourselves. Don’t content yourself with watching other people race. The Richard Petty Driving Experience gives you a unique opportunity to get behind the wheel of a NASCAR vehicle for yourself. And while you’ll be expected to adhere to certain safety standards, you can even pass other vehicles. You can expect to spend anywhere from $200 to $500 on a bona fide racing experience at this venue. If you aren’t ready to take the wheel, you can go for a NASCAR ride-along for the reduced price of $100. The organization conducts its events at racecourses throughout the country. Locally, you’ll be able to hop into a stock car at Indianapolis Motor Speedway. Just make sure to book your event in advance. These world-class racing experiences are located in and around Indianapolis, which is only about a 20-minute drive from Westgate Chrysler Jeep Dodge in Plainfield. The next time you’re in town, we hope to see you at the track.